Best quality every time. 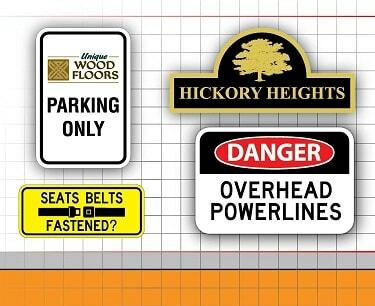 Our custom traffic and parking signs are MUTCD / DOT compliant and made with the highest quality .080 aluminum, coated with the industries best 3M or Avery reflective sheeting and printed to last beyond the sheeting warranty. Whether you are looking for a customized street sign, customized road sign, customized traffic sign, customized parking sign or whatever customized sign you are searching for TrafficSigns.com will provide you with the quality custom sign you are looking for. If you don't see what you need please contact us by phone or email for a quote on your customized signs. We will help you choose the right material for your custom traffic signs. Temporary or permanent, reflective or non reflective we can help you save money and get the quality traffic signs you are looking for. Call, Email of Fax your sign ideas. We will design your custom signs and send you a proof. Add a logo, artwork or request a special color at no extra charge. Call, Email of Fax your sign ideas. 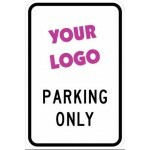 We will design your parking signs and send you a proof. Add a logo, artwork or request a special color at no extra charge.